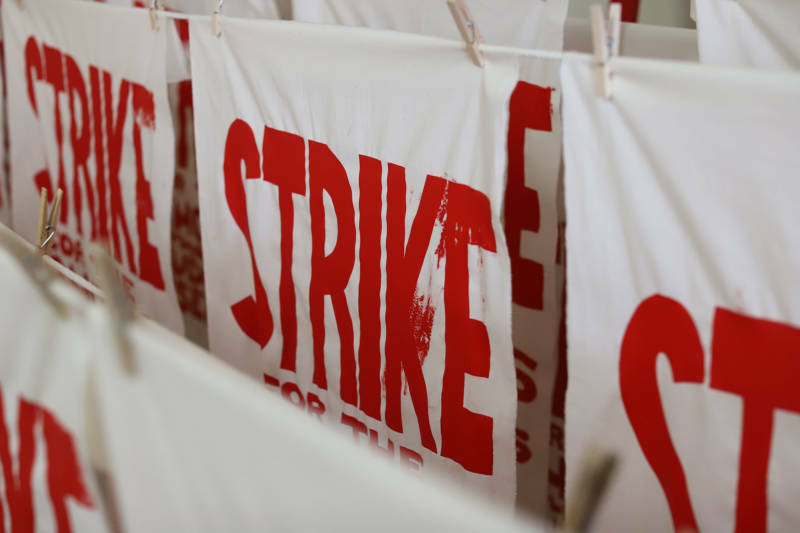 In a parking garage below the Oakland teachers union headquarters on Sunday, dozens of volunteers labored over the banners, posters and picket signs illustrating a historic strike. A crowd of retired and current educators, college students and district parents with their children turned out for the third “art build” supporting the Oakland Education Association, whose 3,000 members are currently on strike as the union negotiates for higher wages and smaller class sizes. 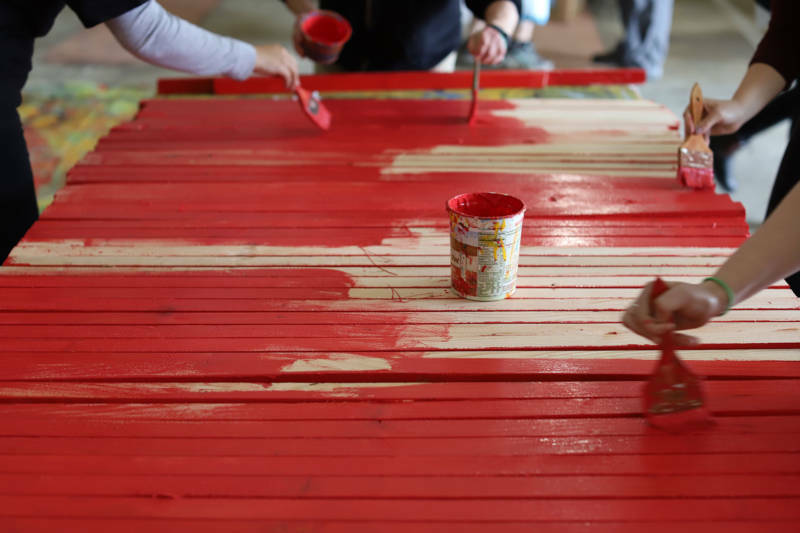 They spent the Sunday morning cutting canvas, assembling picket-signs and screen-printing images sourced from local artists, including Melanie Cervantes, Favianna Rodriguez and Micah Bazant. 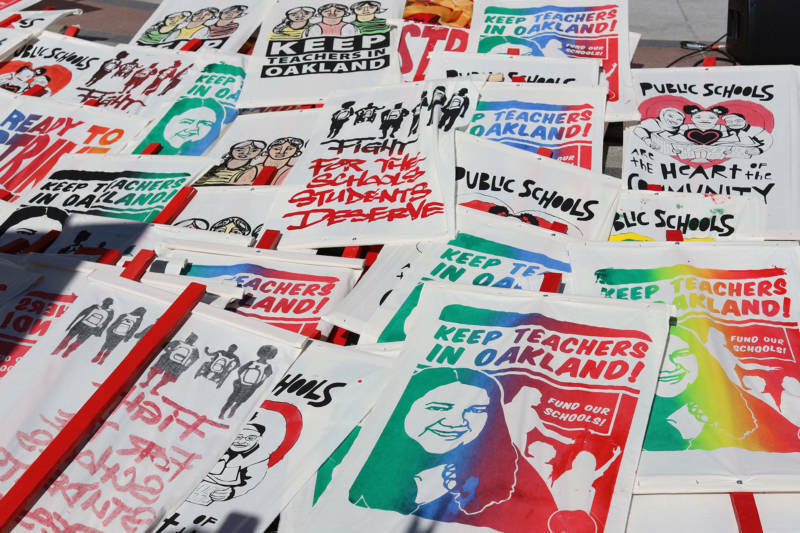 The dominant color was red, while the messages, rendered boldly alongside illustrations of women and backpacked children, centered on fighting for the schools teachers and students deserve. The model, common in activist circles, is gaining traction in public education advocacy. 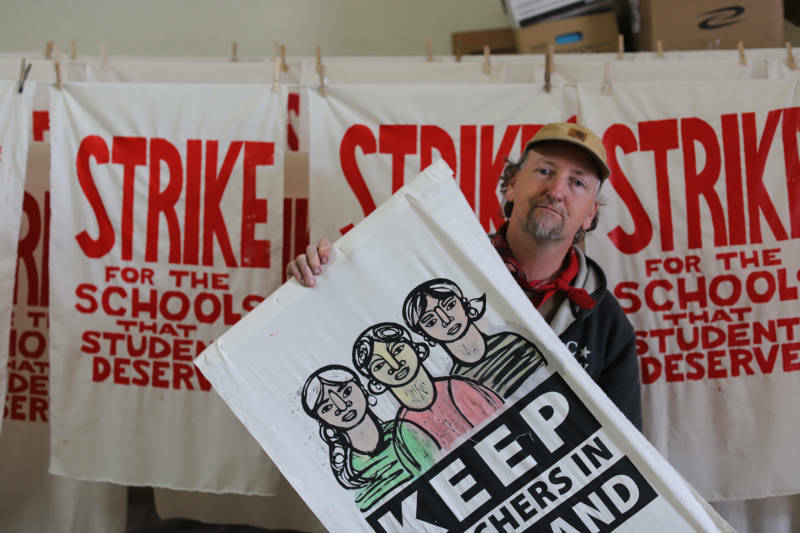 After organizing art builds in the Midwest, Joe Brusky and other workers with the Milwaukee Teachers Education Association got the attention of the National Education Association. Since, they’ve traveled to Los Angeles and Oakland to bring people together over pro-union artwork. In January, Solnit and union supporters logged three 12-hour days to produce more than a thousand posters and signs, including several enormous, hand-painted banners. 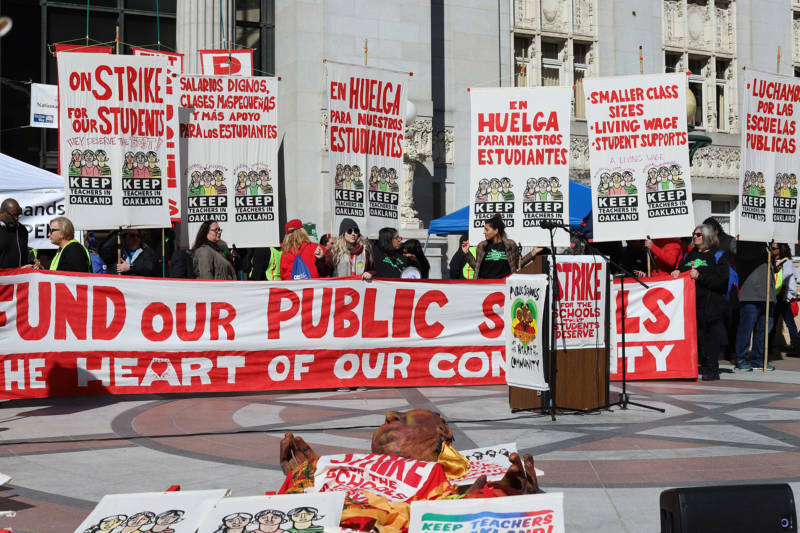 The event on Sunday served a practical purpose—more signs for picketers at school sites—but it was as much about continuing to build community and momentum for the labor struggle, according to Brusky. Solnit brought his experience as an activist to the art build. Tall banners, seen resting against Oakland City Hall during recent rallies, were constructed similarly to ones at Standing Rock; they can withstand high-speed wind and rain. And the canvas is fairly thin, Solnit noted, the better to let backlight make the message pop. “So it’s like a stained-glass window,” he said. Solnit said he’s never seen a national union stress art in a labor struggle like the National Education Association, which is subsidizing Brusky and his fellow organizers to spread the art build model to other locals. On Sunday, it seemed to help with recruitment. For some volunteers, including a UC Berkeley student, it was with their first encounter with organized labor.